The rise of prescription opioid abuse during the last decade has produced a significant increase in deaths from opioid overdose. Methadone, with 4 million prescriptions written for pain in 2009, has now joined oxycodone, hydrocodone, fentanyl, and morphine as the primary agents. Overdoses of prescription opioids have also changed the U.S. landscape for poisonings. In the last 3 decades medication contributions to poisoning rates have risen from 55% (1980) to 90% (2004 and 2008), with over 40% of medication related poisonings stemming from prescription opioids. Recently, much was made by the media when vehicle traffic deaths were exceeded by drug overdose deaths (Figure 1 below), the impetus for this dramatic shift being the rise of prescription opioid abuse (Figure 2 below). In addition to the majority of deaths occurring in 45 to 54 year olds, increases have also occurred in children/ adolescents and the elderly. Being smoke-free is important to heart health. This Valentine’s Day, give a special gift to yourself or someone you love. Quit smoking or encourage your loved ones to quit. Now’s the perfect time! February is filled with heart-clad images celebrating Valentine’s Day. Although the history and evolution of Valentine’s Day are attributed to a number of different legends, what is certain is that February 14 is associated with love, care, and the heart. Nearly 50 years ago, February was designated as American Heart Month, which has further cemented the heart as an ever-present symbol during this month. This national observance raises awareness about the risks of heart disease and lifestyle changes that can reduce cardiovascular risks and promote healthy hearts. The Million Hearts™ Campaign, recently launched by the Department of Health and Human Services to prevent one million heart attacks and strokes over 5 years, is also keeping heart health in the forefront at this time. Given that February is recognized as a time to celebrate love, caring, and heart health, what better time to improve your own heart health or encourage loved ones to improve theirs by quitting smoking? About 130,000 cardiovascular disease deaths per year in the United States are attributable to smoking. Also, approximately 26% of heart attacks and 12-19% of strokes are attributable to smoking. The Surgeon General has concluded that cigarette smoking greatly increases one’s risk for heart disease. Being smoke-free and eliminating exposure to secondhand smoke is important to heart health. When you smoke or are exposed to secondhand smoke, cells that line your body’s blood vessels react to the poisons in tobacco smoke almost immediately. Your heart rate and blood pressure go up. Your blood vessels grow narrower. Chemical changes caused by tobacco smoke also make blood more likely to clot. Clots can form and block blood flow to your heart. Smoking is one cause of dangerous plaque buildup inside your arteries. Plaque clogs and narrows your arteries. This can trigger chest pain, weakness, heart attack, or stroke. Plaque can rupture and cause clots that block arteries. Completely blocked arteries can cause sudden death. Smoking is not the only cause of these problems, but it makes them much worse. Tobacco smoke hurts anyone who breathes it. When you breathe secondhand smoke, platelets in your blood get sticky and may form clots, just like in a person who smokes. Research shows that even spending time in a smoky room could trigger a heart attack. There is no risk-free level of exposure to secondhand smoke. Even brief exposure can be harmful to your health, especially if you are at risk for heart disease. You have years of life to gain and love to give by quitting smoking. Your risk for heart attack drops sharply just 1 year after you quit smoking. In fact, even if you’ve already had a heart attack, you cut your risk of having another one by a third to a half if you quit smoking. And because secondhand smoke also affects others and can increase their risk for heart attack and death, quitting smoking can help protect your loved ones. Make an effort during this heartfelt holiday to stop smoking and/or to encourage your loved ones to stop smoking. For free quit support, call 1-800-QUIT-NOW (1-800-784-8669; TTY 1-800-332-8615). This service provides free support and advice from experienced counselors, a personalized quit plan, self-help materials, the latest information about cessation medications, and more. Cessation services and resources are also available online atwww.smokefree.gov . These Web sites provide free, accurate, evidence-based information and professional assistance to help support the immediate and long-term needs of people trying to quit smoking. Millions of greeting cards are sent each year on and around Valentine’s Day to express love and care. This year, use Valentine’s Day to promote a smoke-free, healthy heart. Send one of the following e-cards to your loved ones who smoke. Following the tips below can cut your flu risk in half. Use soap and water. Use a towel to turn off the faucet and open the door. If there’s no water, use a hand sanitizer that contains alcohol. 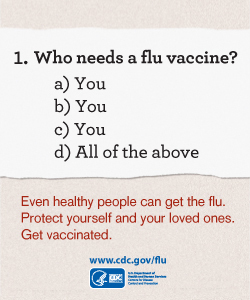 For even more protection, talk to your health-care provider about getting a flu vaccine. Avoid close contact with people who have a cold or the flu. “Flu shots” — inactivated vaccines (containing killed virus) that are given with a needle. There are three flu shots being produced for the United States market now. A hi-dose vaccine for people 65 and older which also is intramuscular. This vaccine was first made available during the 2010-2011 season. An intradermal vaccine for people 18 to 64 years of age which is injected with a needle into the “dermis” or skin. This vaccine is being made available for the first time for the 2011-2012 season. The nasal-spray flu vaccine — a vaccine made with live, weakened flu viruses that is given as a nasal spray (sometimes called LAIV for “Live Attenuated Influenza Vaccine”). The viruses in the nasal spray vaccine do not cause the flu. LAIV is approved for use in healthy* people 2 to 49 years of age who are not pregnant. Treating colds and the flu is about comfort. Get lots of rest, especially while you have a fever. Rest helps your body fight off illness. Drink lots of fluids. This helps loosen mucus. Soothe a sore throat by gargling with warm salt water. Or try throat spray or lozenges. Use saline (salt water) nose drops. They loosen mucus and moisten tender skin in your nose. Avoid alcohol and tobacco. They can make cold symptoms worse. Use Tylenol® products for fever, body aches, sore throat, and headache. You might notice some new faces when you check-in next time. We’re always striving to improve the quality and efficiency of our patient care, and we hope you find our new people friendly and helpful. You may also notice that we’re getting busier. There are some primary care doctors in the area who have stopped accepting insurance. This is good for our clinic, but we may have less tolerance for walk-ins and same day appointments on some days. Please keep this in mind if you’re thinking about putting something off until the last minute. We’ll still try to get you in the same day for “urgent care” needs, but the schedule is tightening. Insurance companies determine what tests, drugs and services they will cover. These choices are based on their understanding of the kinds of medical care that most patients need. Your insurance company’s choices may mean that the test, drug or service you need isn’t covered by your policy. Take the time to read your insurance policy. It’s better to know what your insurance company will pay for before you receive a service, get tested or fill a prescription. Some kinds of care may have to be approved by your insurance company before your doctor can provide them.